Our dedicated, experienced professionals have delivered piece of mind to businesses across the nation for over two decades. CMS offers a multitude of customized service plans. From Guaranteed Response Only to Full System Coverage, we have a plan to fit your business needs and budget. 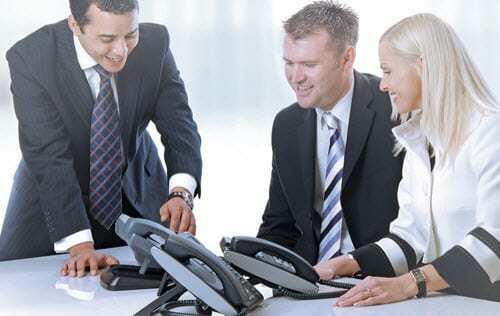 We offer service plans for the ShoreTel, Mitel, NEC and Siemens/Rolm platforms. Our Customer Service Center is available around the clock to take your call. All of our Field Service Engineers are trained and certified by the original equipment manufacturers. All of our service plans include a two hour, on-site response to major system failures, twenty-four hours per day, seven days a week. Minor outages are addressed within twenty-four hours, Monday through Friday 8AM to 5PM. All plans include customer defined major outages allowing you to define which functions of your system are mission critical to your business. CMS offers some of the lowest labor rates in the country. We’re here to assist you with all your moves, adds and changes whether it’s a single phone or an entire system. All plans include the assignment of a Primary and a Secondary Field Service Engineer to ensure our personnel are familiar with your system, design and facility. We keep an inventory of critical spare parts in each of our local warehouses. These spare warehouses are backed up with over $2M of inventory in our 45,000 square foot state of the art facility at our corporate office in St. Louis, MO. Whether your business experiences a minor disaster such as a fire in your data room or a localized major disaster such as an earthquake or hurricane, CMS has you covered. We keep an inventory of fully functional, ready-to-install systems in our various warehouses across the country. With over 40 certified engineers company wide, we can dispatch a disaster recovery team to any of our locations to make sure our customers are back up and functioning as quickly as possible. Many businesses have turned to cloud services for data security and integrity. Companies can store critical business data in a cloud storage environment and have access to that information anytime, anywhere, even after a catastrophic loss of equipment due to fire, flood, theft, power failure or a multitude of other threats. Cloud computing solutions such as email, cloud backup, or a cloud based server strategy is an excellent part of any business continuity or disaster recovery strategy. Remote Management such as server and workstation monitoring provides a pro-active approach to IT support. Rather than simply monitoring servers, our system offers the capability of antivirus and allows IT Managers the ability to monitor RAID arrays, remote offices, ISP connections, bandwidth usage, websites and more. In short, we help you monitor the key parts of your whole network that cause the most grief – and alert you proactively. Experience is what counts when it comes to IT consulting. The experienced staff at CMS can assist your organization with a wide variety of IT related projects. With our expertise you can be rest assured that your project will be completed on time and on budget. In most cases expensive on site visits can be avoided by utilizing remote support from one of our qualified technicians. Remote support allows for an immediate response that is both efficient and effective. Our remote tools also allow us to transfer files, view resources, analyze error logs that provide the information for a fast and successful support session that will minimize downtime and keep workers productive.